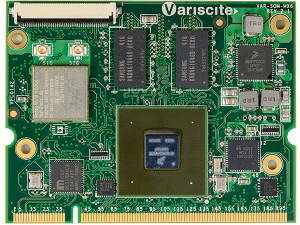 Variscite a leading SOC manufacturer from Israel, has released a new version of its wireless-enabled “VAR-SOM-MX6” module. It adds support for the i.MX6 QuadPlus SoC. Variscite is renovating the old COM once again with a model that adds support for NXP’s QuadPlus. It is going to be a new addition to the i.MX6 Solo, DualLite, Dual, and Quad versions. The module runs Linux 4.9.11 and Android 8.0 (Oreo). The i.MX6 QuadPlus, which is also available on the Wandboard Reload SBCs, iWave’s i.MX6 COMs, and other boards. It has the same, 1.2GHz quad-core CPU as the Quad, but offers an enhanced Vivante GC2000+ GPU with 50 percent elevated graphics performance. The SoC also provides HD-resolution H.264 decode and encode. The 2018 version of the VAR-SOM-MX6 is identical with the pin configuration as the earlier models. It has up to 4GB DDR3 RAM and data storage of 4GB to 64GB via eMMC and 128MB to 1GB NAND flash. There’s a GbE controller, although with the usual i.MX6 bandwidth limits. The 802.11n WiFi, which is accompanied by Bluetooth 4.1 with BLE, is available with optional 2×2 MIMO. The 67.8 x 51.7mm module houses dual 24-bit LVDS interfaces with resistive touch, as well as an HDMI and DSI interfaces. The long list of peripherals includes dual CAN, SATA, PCIe, MIPI-CSI, and much more support. The module has a range of -40 to 85°C working temperatures. The $399 VAR-SOM-MX6 Starter Kit includes the carrier board with the VAR-SOM-MX6 module, an antenna, a debug cable, a microSD card, and a carrier board design package. The $499 Development Kit version adds a 12V power supply, an Ethernet cable, and a 7-inch resistive touch panel. The $549 Development Kit Pro advances to a 7-inch capacitive touchscreen.